Investigate the book of Genesis, Matthew and Acts. See how God always keeps his promises. Investigate the beginning of everything in the book of Genesis. Zoom in on Matthew and Acts to discover who Jesus is and why He came. See how God always keeps his promises. Issue One of XTB is called The Book of Beginnings and will help you investigate the beginning of the universe, the beginning of the early church and the beginning of Jesus' life and teaching on earth - plus you get free Stickers! The first 15 days look at Acts, chs 1-4. Days 16-29 make a start in Genesis, chs 1-9. Day 30 takes a little look at Hebrews 11:7, relevant to Genesis. Day 31 starts Matthew and continues to Day 50, ending in ch 7. Day 51 picks up in Genesis again and covers chs 12-22 over 14 days. 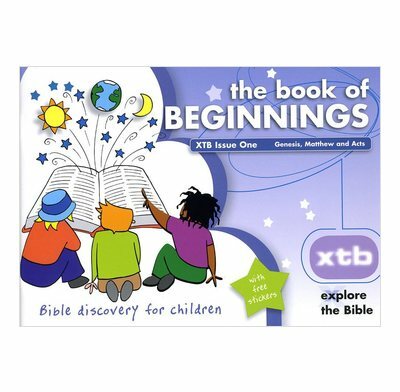 XTB is beautifully presented with full-colour illustrations and is a series of 12 books which, if used on a quarterly basis, will help a child cover all of the main books, themes and characters of the Bible in 3 years. If the child is a little younger they will still need to be acompanied. This is because there is normally between 2 and 8 verses to read from the Bible. The materials are particularly good for kids who like word games to fill out. Absolutely love this! I am a children's ministry worker and this has played a huge part of the children's' spiritual growth. Through these books they have come to know and understand the Word and God so much more. I am seeing a difference in them since they started using these books. I've used them for one-to-one studies and then sent them home with children to do in the week. Easy to read, nice to look at, explains everything well and all in manageable bitesize chunks! Love it! Cannot recommend it enough! My 6 year old loves these. We are half way through the first book and he is enjoying them - particularly the stickers and the codes. I thought it might be too advanced for him but he is understanding them and getting alot out of it. We bought these for our 5 year old Daughter. She is too young for them really, and they'd suit better an older child, but already we have had some excellent times in God's word using XTB. I am very impressed with the way that - consistently - the point of the bible passage is very clearly the point of the notes. And the variety of ways that's communicated - through fun and puzzles and games, but also points at which you have to stop and really think things over - make for a great devotional time. I have just bought a set to work through - for the third time (third boy!). They are excellent and form a great foundation for Bible study. What's more they engage the children and they are fun. And not too much writing but the kids do have to focus themselves. They are not too girly either. I waited till my boy was 6. This is because there are only 12 of these study books. More would be welcome. I will probably do them again. Have looked at a lot of studies. These are the best. I have learnt loads from them! We have started to use this material for our small group of 7 to 11 year old children. We usually have an average of around 5 children in the Sunday group and the children have loved having their own booklets to fill in and the teachers have not found it too time consuming to prepare.